Where do patterns come from? While some might be computer-generated using the latest in image scanning and digital printing technologies, many more can be sourced to the Design Library—the world’s largest collection of patterns. 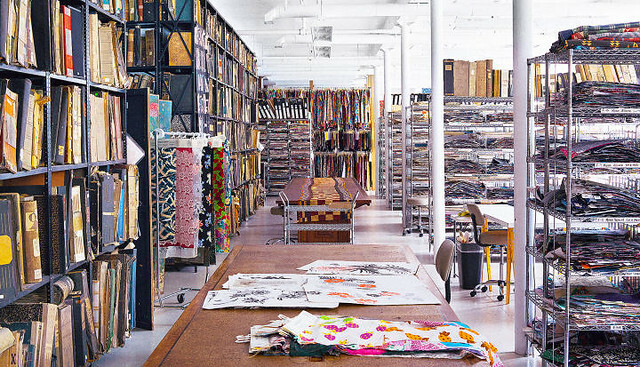 Located about 75 minutes from Manhattan in the Hudson Valley village of Wappingers Falls, the Design Library holds more than 7 million different documentary fabrics, original paintings, wallpapers, embroideries, and yarn dyes inside a huge, 12,000-square foot converted fabric mill. Designers hailing from couture fashion brands, as well as those from national chains and big-box stores, all travel to the library to find historical material to use, adapt, and remix in service of their own creative vision. As we agree with Charles Eames that “the details aren’t the details, they make the design,” we might recall that it was on this date in 1906 that Karl Ludwig Nessler (who changed his name for commercial purposes to “Nestle”), demonstrated the first “permanent wave” for hair in his beauty salon in Oxford Street, London, to an invited audience of hair stylists. The hair was soaked with an alkaline solution and rolled on metal rods which were then heated strongly. This initial method had the disadvantages of being expensive, very lengthy (about 5 hours) and required a cumbersome machine beneath which the client was obliged to wear a dozen brass curlers, each weighing 1-3/4 lb. But Nessler/Nestle continuously improved his process. With the outbreak of WW I, he moved to the United States and opened salons in New York, Chicago, Detroit, Palm Beach and Philadelphia, ultimately employing 500.